TIPS WIN: Happy St. Patrick’s Day! Victoria, B.C. – The Everett Silvertips broke their franchise record for most goals in a season (245) on the strength of a hat trick by Patrick Bajkov in his WHL regular season finale, clinching the U.S. Division title and top record in the Western Conference in an 8-1 romp over the Victoria Royals before a crowd of 7,006 at Save-On-Foods Memorial Centre on Saturday. Bajkov ends his WHL regular season career with the all-time assist record for the Silvertips as well, collected on the final goal of the regular season involving all 20-year old players Kevin Davis, Matt Fonteyne, and Bajkov. Fonteyne ended his WHL regular season career with a goal and four assists. Kevin Davis ends his WHL regular season career with three assists. All three overagers combined for 12 points in the victory. 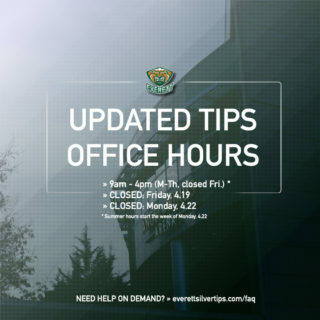 UP NEXT: The Tips open the 2018 WHL Playoffs against the Seattle Thunderbirds with home ice advantage, starting with Game 1 on Friday, Mar. 23 at 7:35 p.m. (1380 AM / FM 95.3 / WHL Live) at Angel of the Winds Arena. 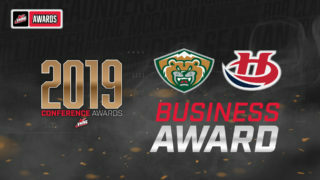 Tickets are on sale at www.everettsilvertips.com/playoffs. The first goal was a great summary of the Silvertips’ squad this season—they never quit. 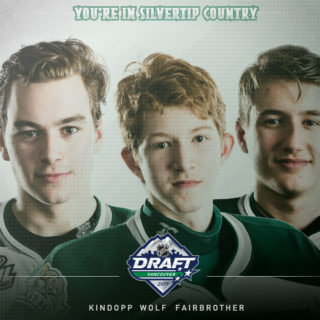 The play started off with Matt Fonteyne getting a shot off McNabb and Connor Dewar grabbing the rebound; the puck winded up on Bryce Kindopp’s stick for the simple conversion of McNabb’s head to make it 1-0 Tips at 15:12. Carter Hart made a huge glove save off a 2-on-1 versus Tyler Soy and Matthew Phillips, the offensive dynamos for the Royals midway through the first to keep the Royals scoreless. Everett got their first attempt on the power play at 13:46 as Noah Gregor went off for an elbow. The Silvertips did a great job on the power play with cycling the puck and getting great chances against Dean McNabb. At 15:07, Patrick Bajkov got his 31st of the season as he got a power play toe drag and wrister past McNabb thanks to a nifty setup by Fonteyne and Davis to make it 2-0 Tips. The excellent first period ended with a third goal from Connor Dewar, which was his 37th, at 17:19 with assists from Ondrej Vala (wrist shot) and Riley Sutter. The period ended with a successful penalty kill by the Tips as Riley Sutter went off for a trip. The Silvertips kept rolling through the second period in an impressive fashion. Connor Dewar got his second goal of the game 39 seconds into the period on the power play as Victoria got a penalty at the very end of the first period. Dewar’s goal was due in part to a nice play by Garrett Pilon and Fonteyne. 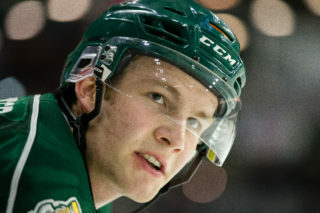 Jake Christiansen went to the box for a check from behind and none other than Phillips made the Silvertips pay with a power play goal at 5:55, spoiling Carter Hart’s shutout on a deflection at the net. The Tips got one back on their next power play as Patrick Bajkov sniped it past McNabb to make it 5-1 Tips at 10:37 with Fonteyne’s fourth assist of the game and Davis’ second assist of the game credited. The magic didn’t stop there for Bajkov as the closing minute for the period, he went all in against McNabb and got an unassisted goal for the hat trick to make it 6-1 Tips at 19:26. Despite Victoria’s lone goal, it was all Everett in the second as they had 14 shots versus Victoria’s 4. The third period began with a goaltender change but not the team you’d think; Dustin Wolf relieved Carter Hart in net as the Silvertips were already assured of the U.S. Division title and Western Conference’s top record. Victoria had an early power play as Vala went off for interference but Wolf and the special teams were sharp. Wolf’s first big test came on a 2-on-0 were he swiftly made the toe drag save to prevent the Royals from doubling the score. At 6:46 a sweet pass by Connor Dewar landed on Bryce Kindopp’s stick and he rocketed past McNabb for his second goal of the night, making it 7-1 Tips. Dewar’s assist was his fourth point of the night. Victoria actually regained a bit more control throughout the third period but Dustin Wolf did an excellent job with keeping pucks out of the net. 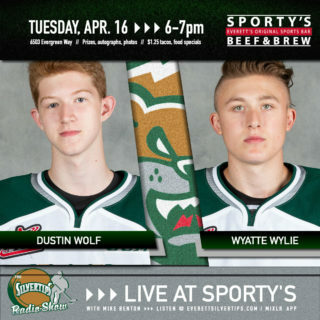 Everett was not done for the night – Fonteyne deflected a puck shot by Kevin Davis from the point to make it 8-1 Tips at 15:51; Patrick Bajkov set up the play and officially passed Zach Hamill for the all time assists record for the Silvertips. Carter Hart and Dustin Wolf’s counterpart, Dean McNabb, made 26 saves. Notes: Silvertips scratches included Akash Bains, Martin Fasko-Rudas, Ethan O’Rourke, Blake Lyda, Jameson Murray, and Kyle Walker … the Silvertips won consecutive division titles for the first time since 2006-07 … Dennis Williams tied Craig Hartsburg for most wins by a first year head coach in Silvertips history (47) … Bajkov earned four points to become the first 100-point scorer in Tips history … Fonteyne tied his career high with five points … Connor Dewar finished as the Silvertips leader in goals (38).